Publication Information: Quarto, Inc. 2008. 160 pages. Book Source: I am a knitter. So, I pick up knitting books on my trips to the library. This one caught my eye on the library shelf. Favorite Quote: "There's always something new for a keen knitter to discover." 200 Knitting Tips, Techniques & Trade Secrets is, as the title suggests, a book about knitting. The book is organized into sections dealing with different aspects of knitting - equipment, patterns, garment design, basic techniques, advanced techniques, knitting in the round, creative techniques, and assembly. Each section is further divided into short sections dealing with specific topics. Topics range from reading a pattern to choosing a garment shape for your body shape, from stitch patterns to hand dyeing yarn. Each topic includes descriptions, color illustrations, ideas to try, and tips to avoid or fix common mistakes. Please note that while the book does have some stitch patterns, it is not a pattern book. The book targets both novice and experienced knitters. I am not sure where I would put myself in that range - not a novice but not experienced either. I found the descriptions of each section contained enough detail for me to incorporate the technique into my knitting. Other knitters may have a different reaction. Overall, an okay knitting reference book. Publication Information: Deanna Lynn Sletten. 2012. 243 pages. Book Source: I got this book as a Kindle freebie on Amazon. I read it because I enjoyed and reviewed another book by the author. Favorite Quote: "Now what do I live for? ..... For yourself, man...for all the things you haven't done yet. For all the things that you are. For you!" 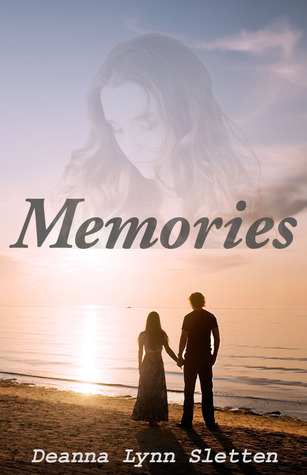 Memories is a love story - love found, lost, and rediscovered. It is the story of Michael and Dani. The book starts at the end of Dani and Michael's story - at Michael's funeral. Dani is reflecting on their lives. They met. They loved. They lost each other. They reconnected. The book then goes back to the middle of Dani and Michael's story - to the the time that they rediscover each other. At that time, Dani is a woman living with a devastating memory. She found love once in her life and then lost it. The memory of that love impacts her entire life, present and future. Michael is that love and the one responsible for Dani's sad memories. He is the Vietnam veteran whose memories of war haunt and torment him. When they first met, Dani was the one person who could calm his torment. They found each other once, only to be driven apart by circumstances. For each, the memories of the other remained. As they meet again, the question is if both can reframe the memories of the past and find each other again even though difficult circumstances threaten to drive them apart again. The story of this book is not an unusual one. The way it's told, however, adds movement and depth to the book. It goes from the middle out in both directions - into the past to see their memories of their relationship and into the future as they rebuild their relationship. It is interesting to see how the memories of their past influence their assumptions, actions, and understanding as they rebuild their relationship. Publication Information: Doubleday, Random House Inc. 2012. 589 pages. Book Source: I received this book through the LibraryThing Early Reviewers program free of cost in exchange for an honest review. The book arrived as a bound galley. Favorite Quote: "Two things count in this business...One is that you have to be a gentleman. Your word is your bond....And you've got to be able to get along with people." More Than You Know is a saga of a family and the people who surround them. It is set in 1960s London in the world of high fashion and real estate. It is the story of Eliza, a woman from the "upper" class of London, and Matt, a working-class man making his own way in the world. It is the story of how they come together, the family they create, and how that family falls apart and comes together. More Than You Know is also the story of societal class lines and the struggle to find your own identity in the world regardless of those lines and where you come from. Being told where you "belong" or thinking where you belong, yet striving for something different.Eliza sets out to not follow the expected debutant path but to create her own identity in the fashion industry. Matt sets out to reinvent himself away from his working-class roots into the life of a real estate tycoon. Surrounding them are varied characters who also walk this path in some way. Some do it with success and grace; some less so. All these stories are told in the context of Matt and Eliza's relationship - through meeting, courtship, marriage, parenthood, divorce, and beyond. More Than You Know was an okay book. The story is told in almost 600 pages. The first quarter of the book seemed to be introducing the characters and setting up the main plot line of Matt and Eliza. It got a little long. Some of the characters were interesting, and some of the side stories were interesting. However, there are a lot of them! Overall, not a bad book but not a great book either. Publication Information: Random House. 2012. 443 pages. Book Source: I read this book this month's selection for my local book club. Favorite Quote: "You don't need to tell yourself that your father was this and your mother was that. You can be anyone you want." The Orphan Master's Son is a story of North Korea. It is the story of one man - Jun Do - who really could be any person. A John Doe if you will. It is a story of a regime so different from ours, and a life so different from ours. Different yet the same, for human nature and the need to love and be loved is the same everywhere. It is a story of hardship and difficulties. I started reading this book about a month ago. I read about a hundred pages. Since then, the book sits on my side table. I have had no inclination to pick it up again. I have moved on and read several other books and am trying to gear up to go back to it. It is a selection of my local book group, and I do try and read those books. I have discovered some gems that way. Unfortunately, I really don't want to pick this book up again. The book has received such rave reviews. Unfortunately, in the first hundred pages, I found the writing style confusing and sometimes difficult to follow in terms of narrator and time period. I felt no emotion for the main character. I could not relate to him, and even given his dire circumstances, did not develop a sense of hoping for a happy ending for him. I wanted to like this book. From the book description, I felt like I would enjoy the book. Unfortunately, I think I am abandoning it at about 100 pages. If, even after 100 pages, a book cannot engage me, then I don't feel a need to finish it. Publication Information: Harper Collins. 2012. 447 pages. Book Source: I received this book through the LibraryThing Early Reviewers program free of cost in exchange for an honest review. The book came as an uncorrected proof. Favorite Quote: "We live up to those who shaped us by honoring their strongest values, by caring for those we cherish, and caring for those that they cherished. By being our best and doing our best." 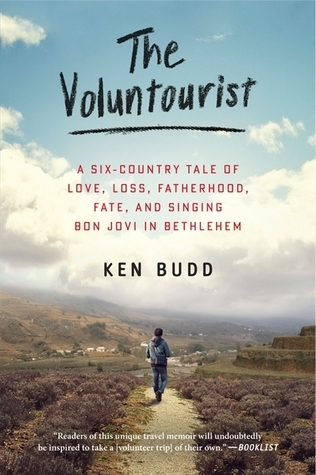 The Voluntourist is subtitled "a six-country tale of love, loss, fatherhood, fate and singing Bon Jovi in Bethlehem". This memoir really tells three stories. It is a look into the growing popularity of voluntourism. The book also is a travel journal, describing the places and people Ken Budd encounters on his journeys. Finally, this memoir is a personal journey as the author struggles to reconcile to his father's death and to the fact of his loving but childless marriage. Voluntourism is the idea of people traveling to different locations of the world, combining travel and vacation with a chance to do some good. Ken Budd has traveled multiple times as a voluntourist, sometimes with his wife and sometimes alone. The projects he describe range from rebuilding homes in New Orleans to studying climate change to working orphans and special needs children. He describes the amazing need for help, the ability of these projects to utilize whatever skills a person brings, and the sometimes discouraging feeling of how little you can do in a short time. The book talks about the challenges and rewards of voluntourism presenting a useful perspective for anyone considering such a trip. In the context of the book, Ken Budd's memoir also acts as a travel journal. He travels to many different places including Ecuador, Kenya, China, and Palestine. Through his experiences, we get a brief look into these places and people, allowing the reader to be an armchair traveler. What makes it more interesting is that this is not a typical tourist's view, but a deeper look through the people that he meets. The final aspect of the book is Ken Budd's personal journey. He undertakes these adventures as he feels his life incomplete after the death of his father and after accepting the fact of a life without children. For me, this was the incomplete part of the book. The projects and the places of travel were the highlight of the books. The emotional journey is reflected in glimpses making parts of the book come across in a somewhat detached manner. I wish there was more of his story.